I had a bit of fun with this background – and hope you’ll enjoy learning how I created it! These three little images from Darcies were stamped together onto one piece of paper by masking…then I worked crazy magic on them with my Copics! Watch the video belo wor click HERE to see it in HD on YouTube. Stunning! It’s just amazing that you started with a piece of white cards to keep and when you finish there is absolutely no white. Your backgrounds are amazing. Loved the way you worked in all the colors and it didn’t turn out all muddy! Pure magic! Love how you created the colors and the scene. Very good work, as always Sandy. I love how easy you make it look. You’ve done it again! Your creative eye is so inspiring. Love your work! Awesome coloring as always. Too bad I don’t celebrate Halloween. TFS the video. Always so inspiring. Your carmel apple looks good enough to eat! 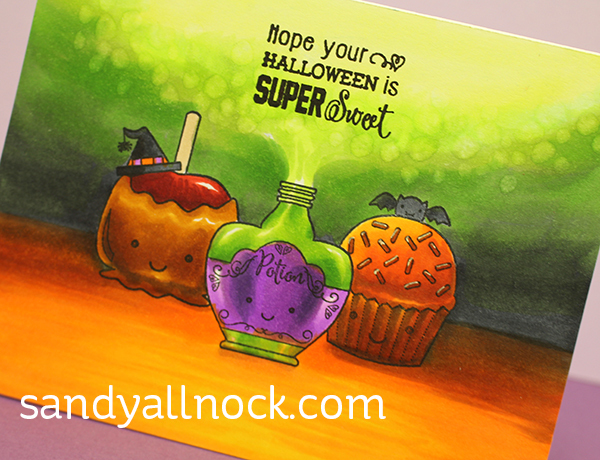 Great “All Hallows Eve” card! Soooo cute – love it! Girl, you and those markers were meant to be together! I love the coloring in that card and the video was fascinating to watch. 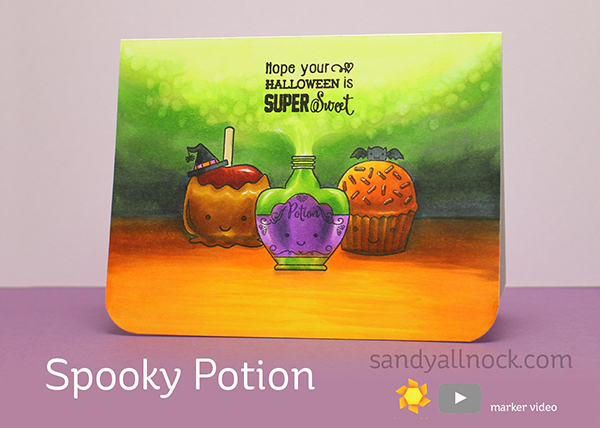 What a fun take on a Halloween card! Now I need to check my stamp stash to see if I have any potion bottles!